Gene did not do well in school. He was a troublemaker who loved racing his ’55 Chevy. But he was more than that. He had an inherent leadership quality that others saw in him, which they helped develop and foster. As a professional, Gene has worked in the administrative post of several of the United States’ top universities including Stanford, Columbia, and University of California – Irvine for more than two decades. In 2005, he returned to Hawaii to share his expertise in running huge institutions. Gene has held on to such cumbersome career for he believes in the value of his work. “For an educator, there’s not better feeling than to have a student who has had a tough time and come through it and achieve success,” Gene says. 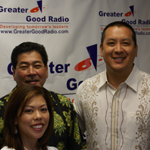 Gene Awakuni stars in this Greater Good Radio interview with his thoughts on overcoming the greatest challenge – one’s self. Listen and find out more. Gene Awakuni joined University of Hawai`i – West O`ahu as Chancellor in March 2005. He is the campus CEO and is responsible for growing the institution from a small campus with about 60 faculty and staff who serve 850 students to a mature campus of over 600 faculty and staff serving 7,600 students and offering a broader array of programs to serve the region and the state. Dr. Awakuni earned his Doctorate in Counseling and Consulting Psychology at Harvard University. He received a Master’s in Clinical Social Work and a Bachelor’s in Political Science from the University of Hawai`i at Mānoa. Dr. Awakuni comes to UHWO from Stanford University where he served as Vice Provost for Student Affairs, Awakuni had a joint oversight for a division of 650 staff. Prior to his appointment at Stanford University he served at Columbia University where he managed a large division of 500 staff and 8 major departments, including dining services, university bookstores, business services, financial services, residence halls, health services, the registrar’s office, and student information systems. He has also served as Vice President for Student Affairs and University Advancement at Cal Poly Pomona, Assistant Vice Chancellor for Student Academic Services at U.C. Santa Barbara, and the Director of Counseling and Psychological Services Center at U.C. Irvine. Dr. Awakuni is trained as a counseling psychologist, has taught several courses relating to the interaction of psychology and ethnicity, and recently coauthored a book entitled Resistance to Multiculturalism: Issues and Interventions. He recently served as the President of the national association, Asian Pacific Americans in Higher Education. While at UC Irvine, he won a teaching award called “My Last Lecture”.